Research in Motion, manufacturers of the popular BlackBerry smart phone series, have announced plans to launch a new web browser for their phones based on the open source WebKit layout engine, and offered delegates at this weeks Mobile World Congress a sneak peak (see the video at the end of this post). His ie-css3.js project (currently in beta) allows Internet Explorer, versions 5 through 8, to identify CSS3 pseudo-class selectors and render any style rules defined with them. All this is achieved by simply including the script, along with Robert Nyman’s DomAssistant, within the head element of your web pages. As you may (or may not) know, I’m an Invited Expert on the CSS Working Group at W3C. Mostly I talk about specs. But today, I’m going to talk about testing. W3C is working on test suites for the CSS specs, and I wanted us to have more web authors involved. Many of you have been frustrated with the inconsistent levels of CSS support across browsers, and I believe collaborative testing is one of the major ways we can improve the situation. Microsoft today offered developers an early glimpse of Internet Explorer 9 (IE9) at their 2009 Professional Developers Conference. 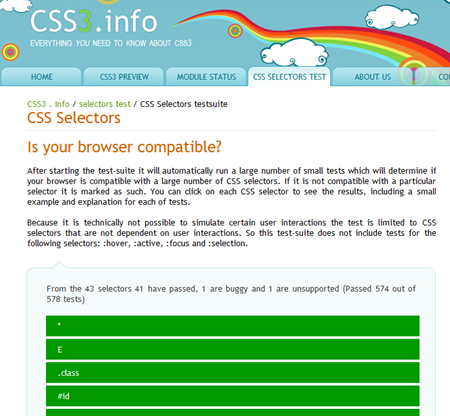 Although only at an early stage of development, the IE9 team already looks to have made some impressive leaps forward in terms of web standards support, particularly with regard to CSS3 selectors which, by the looks of the image below (taken from the IE blog), IE9 appears to score an impressive 574 out of 578 in our CSS3 selectors test, a vast improvement over IE8 which scored only 330/578. IE9 also looks set to boast support for CSS3 border-radius, an improved scoring in the Acid 3 test (if only slightly) and support for HTML5. You can read the full announcement on the IE blog here and we’ll bring you further announcements on the subject as more information becomes available.